A few days before the 90th annual Academy Awards, a grotesque statue of disgraced movie producer and accused creep (85 times over) Harvey Weinstein appeared on Hollywood Boulevard. 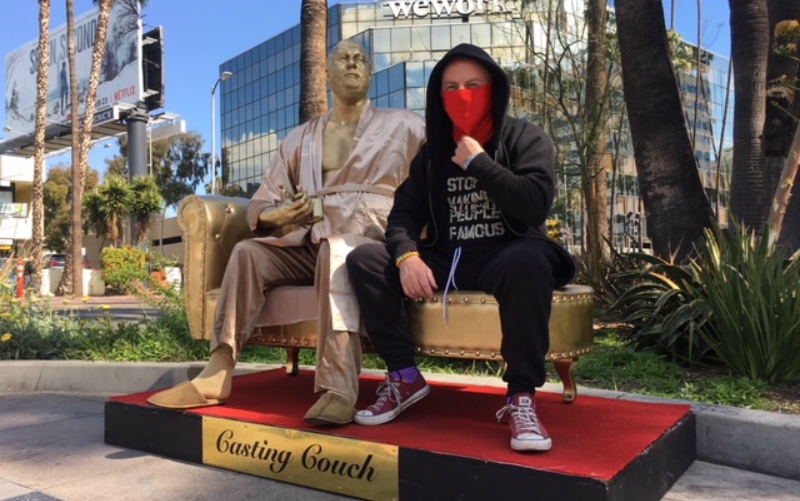 Called Casting Couch, the piece depicts a paunchy, stubble-cheeked Weinstein seated on a chaise lounge in silk pajamas. His left arm is propped on the back of the couch like he’s welcoming an ingenue to sit down next to him; his right hand rests near his crotch, gripping a mock Oscar statuette like a phallus. The sculpture was a collaboration between guerrilla artist Ginger, who crafted those naked Trump statues that popped up around the country in August 2016, and Plastic Jesus, who (again, in collaboration with Ginger) was behind the crucified Kanye West statue that materialized on Hollywood Boulevard in advance of the previous year’s Oscars. From its fabrication to its delivery, journalist and filmmaker (and Los Angeles magazine contributor) Patrick Green documented the creation of the sculpture, as well as the aftermath of its arrival in Hollywood. The result is For Your Consideration, a short documentary that traces the anatomy of an art project gone viral. At the moment, Green plans to release the documentary in early May, but there could be delays as the story continues to develop. “We’ve shot a lot of footage, but the story keeps expanding because the piece, like all good art, drives conversation,” Green says. “I’d love to talk to a Harvey Weinstein victim and get her thoughts about if Casting Couch hurts or helps a cause like the #MeToo movement. In the meantime, he’s dropped the following trailer. “For Your Consideration” Trailer from Patrick Green on Vimeo.